In a small bowl using an electric hand mixer on high, beat egg yolks, sugar and salt until thick and lemon colored - about a minute. On low speed, stir in sour cream, vanilla, zests & flour. Transfer to a floured surface and knead 50 turns (about 2 minutes), adding extra flour as needed. Divide dough in half, keeping extra covered with plastic. On a floured surface, roll each section paper-thin to at least 12” across. Cut into 1 1/4-inch strips. Cut strips into 5-inch lengths. Make a slit in each strip. Pull one end through slit to make a bow tie. Deep fry in oil at about 350-365° F for about 30 seconds, turning once using 2 forks, until lightly golden on both sides. Do not crowd. Drain on paper towels. Let cool an sprinkle with powdered sugar. To re-crisp place on baking sheet in a 325° oven for about 5 minutes. Cool completely and re-dust with fresh powdered sugar. Note: Chrusciki are best served right away but can be stored at room temperature for several days. I store mine on a large platter, separating the layers with waxed paper, and cover them all with aluminum foil, not plastic. 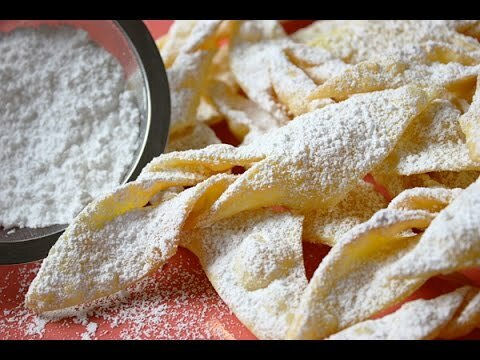 240 Comments on "Polish Chrusciki – Angel Wings"
Jenny, thank you for such the very helpful (and cute) video for making Chrusciki! I remember my Babcia (Dad’s side) also making something… Pierogies, Chrusckiki, Kinidla, Paczki, etc. (sorry about my spelling). But sad to say I never made any of these things with her. My mom taught me how to make Golabki from my Grandmother (Mom’s side). My Aunt had my Babcia’s Chrusciki recipe, so my cousin and I made a batch over this past weekend. We used your video as a help. We split our dough ball (which was a bit larger then yours) into 8 sections. After the 2nd and 3rd roll out and fry they started to come out really good :-). Thank you again for your video. We made 2 balls of dough at the start, because we didn’t realize how far (and how much) one ball of dough would make. Now one ball is just sitting in my refrigerator. Can it be frozen or do you have any suggestions as to something else I could make from it? I have never frozen the dough but I did a search and they say you can freeze doughnut dough so it’s probably worth a try. Paczki, oh how I miss them. Those were my favorite that Grandma made. Happy to see someone mention them. Did your Grandmother put a tiny bit of orange peel in them? My Aunt did and they were good but Grandma’s were better. My Polish mom’s recipe included a shot of liquor. I am going to make these as is to see how they taste. And thanks for your rib recipe – my husband loves it and I’m going to make the fast no-knead bread as soon as I get a metal lid for my dutch oven. Thanks, Jenny, so much for all your recipes and videos. dbl. batch and use a pasta maker to roll the dough. This makes fairly even cookies and can be made thinner than when hand rolled. We can also get them all done in about 3 hours if the dough is made ahead. Oh My!!!! I made these cookies for my fiancées family polish dinner, and they loved them!!! Great cook!! Great recipe. I can’t wait to try.! How can I keep folded Chrischiki fresh while continue to fold? Do I have to use reduced fat Sour Cream since I have the Regular on hand for the Angel Wings. .
Keep everything covered with a towel and make and fry in batches. Hope this helps! After a coworker was describing this cookie he’s had since a child, I had to try and make it. He found your video online and said, “That’s it.” With your recipe and video, I was able to easily make these this past weekend. I took them into work and he said they were JUST like he remembered. I now have a new Christmas cookie for my family that I am going to visit over the holidays. Thanks much! HOw and where can I see the Video..? All videos are below the recipes. Just scroll up. We use a regular frying pan as well. You can control the heat better. Once they are a little golden brown, flip them and in a minute or so on to the pan with the paper towels to absorb the oil. We don’t use veg/canola/ peanut oil as someone previously mentioned you can taste it. My grandmother use an alternative and it is the difference. Nor do we bake them afterward. No need if cooked correctly. So what do you cook them in? I just made these today, I used a canola/ olive oil mix, but after my husband tried these, he said he tastes the oil. I taste it as well, just wondering if I should have used canola on its own. Or the one you used in the video. They look good, I wanted to share them but now I don’t think I want to. If you follow the recipe without any changes, using either canola or safflower oil, they will turn out. Will keep you posted, maybe I will try grapeseed oil.. But I will try sawflower oil first. The absolute best and only way to fry these is with LARD, just like my Bushiaused to do. They fry up very flaky, just tatse great! I have been told my chrusckies melt in your mouth. Your so right pork lard is the best for frying the Polish Bow Ties. You are sooooooo right. Lard is the way my mom taught me to use for these . No oily taste , crispy and great tasting !!! If so what temp. How long. And how did they turn out? I am just getting ready to fry them I am so wzcitend. Your video made it seem so simple. Can the oil be cooled and reused for another batch of chrusciki at a later date? I have not made these for many years as I am now a celiac. I would like to venture into making these if I had a proper gluten free recipe. Your recipe is almost the same as mine but are called Angel’s Wings. Can you are anyone help me convert this recipe into a gluten free one. Thank you. I use king Arthur measure for measure Gluten Free flour for my baking. It’s Certified GF. My wife has severe reaction to gluten (but isn’t celiac) and doesn’t react with the king Arthur brand. Their website says it is safe for people with celiac so it Should work for you too, but please double check. I’d hate to give advice that caused a reaction. Hi Jenny, I love these cookies. I’m Italian & our recipe is almost the same except for the zezt, we use juice. We call them Bow Ties. Thanks for your recipes. There are so many that Italians make with little differences. Have a wonderful Thanksgiving & Christmas. Jenny how can I get your cookbook? It’s probably out of print but almost all the recipes from the book are here on this website and are improved and simplified the way I make them today. Great Video ! I’m going to try to make them for my Polish step-father. Thank you . Hi Jenny!! I thought your voice sounded familiar! I used to watch you in the late 80s early 90s when you had a nationwide TV Show!! Nice to see you back and here on YouTube! Regarding your orange and lemon zesting. Did you know the colder the lemon or orange the easier it is to zest them? It’s true, I just tried zesting a lemon that I accidentally left too long in the freezer and it was a breeze to zest it! Course I had to wait to roll it around when it got warmer to get some juice out but so what! Love all things Polish!! Potica! Thanks for this wonderful recipe, I will have to come back..
My mother also made them with whiskey. Since she was Czech we called them Listy. I made a big batch when my brother passed away to take to the funeral home snack room. I use Brandy in my recipe. Been making Chrusciki for every Easter over the last 30 years, same recipe and somewhat similar to this one. Started making them with my dad and since then carried on the tradition with my kids and grandkids. They are a family favorite! I love your Chrusciki! I made it for a baby shower and Christmas it was a hits. Thanks for the recipe. Thanks for the recipe! The Italians make these too but they call them Frappe. Can you freeze angel wings? How do I freeze them once they are fried and finished. A coworker said I should freeze them in layers in zip lock bags..is this the correct way to freeze them? I have never tried freezing them because they are extremely fragile and I think they would probably crumble when pressed in a freezer bag. If anyone has actually frozen them, please share details on exactly how. Thank you. I have a question about the dough. Can you make it ahead of time and refrigerate it? My recipe actually recommends refrigerating for 1 to 2 hours for easier handling. My babcia used to make these all the time, so nostaligic! I want to make for my boys but no sour cream in fridge, do you think greek yogurt would work? I use my KitchenAid mixer to mix the dough (I double the recipe). Then I use the pasta attachment to get the dough super thin. It’s super easy to do it that way. My husband is Polish and I make these for our family during Easter. Thanks for this delicious recipe! I like that pan you used. Does it have to be a deep pot? Can you use an air fryer instead of a deep fryer? I use an electric frying pan. Keeps the temperature prefect. I’m so glad I found this recipe, the one my mother gave me was from My fathers church, but it made about a 1000. It was the recipe the ladies used for festivals! What type of frying pan do you use? Always wanted to make these. My grandmother and my mother both made them. But since they required frying we were not allowed in the kitchen when they were doing it. They were easy to make. The dough did not break or tear. I was always so afraid to tie them in the knots but it was very easy. Thank you for your instructional video it gave me reason to believe that I could do it too. What would you suggest I use instead of eggs? I’m a vegan. Than forget about it !! Really, just use a couple a egg yokes and get over it !!!!!! You’re not only rude, you’re illiterate. Just because you don’t have ethics around food doesn’t mean you should disrespect people who do. I hope you don’t have any loved ones with allergies – your “get over it” attitude could kill them. What an ugly soul you must have. And I surely don’t have any respect for you, Jenny, for leaving a hateful comment like this up. Love this video, and I love your enthusiasm about these cookies. My grandmother and mother always made these at Christmas time. Rule #4 never inhale while eating them or the powered sure goes right up your nose! I can’t wait to make these. My Babci used to make these when I was little. I haven’t had them for over 30 years. I can’t wait for my family to try them. My two grown sons have heard about them but never had them. Thanks again!!! My Mother (who learned to make these from Babcia) used to make these when I was little. I have not have these in over 40 years but I loved them. Thanks for the memories and maybe I will try to make them! My fiance’s family is Polish and loves these, especially for the holidays. Unfortunately, we aren’t able to find them where we live anymore. A bit of a “dying” art, I suppose? I am going to surprise them by making them to enjoy before our wedding on NYE! One question though — if you want to add some whiskey, how much would you add to this recipe? Would there be other alterations to the ingredients? Thanks so much for helping me keep an important family tradition alive! What is the best way to store. I powdered them and they get soft. Maybe should not be sugared until ready to serve. Make sure they are cool before you add the powdered sugar. I also just added a note to the recipe about storing and re-crisping. Can these angel wings be baked instead of fried.? My mother was German and she used to make these,I loved them, thanks Jenny! No, they must be fried. My Grandma and Mom made these every Christmas. Love, love, love them. And watch out for the flying powder sugar when you bite them!! Thanks for reminding about chrusty/ faworki ! Growing in Poland, faworki were my first food that I remmeber I fell in love at age of 3-4 (not kielbasa, pierogi or bigos) lol. My mama often cooked simplified, hearthy version of these for breakfast. I ate tons of them and never became fat ! What is the simplified breakfast recipe? That sounds like it would be delicious. I am making these cookies today for the first time. I remember my great aunt making them and she was the only one that ever made them perfect. I am hoping to do her proud and make them for my family now. Thank you so much for this wonderful recipe. I haven’t made these since I was a little girl with my Babci. I can’t wait to make them next weekend and carry on the tradition. We always used to store the cookies in a Charlie chip container between sheets of waxed paper. O my I forgot all about the Charlie Chip containers. Wish I still had one. Use the container that 4 – 5 flavors of popcorn are sold in during the holidays. Oh my goodness, my family also always used the Charlie Chip container for storing these!!!!! 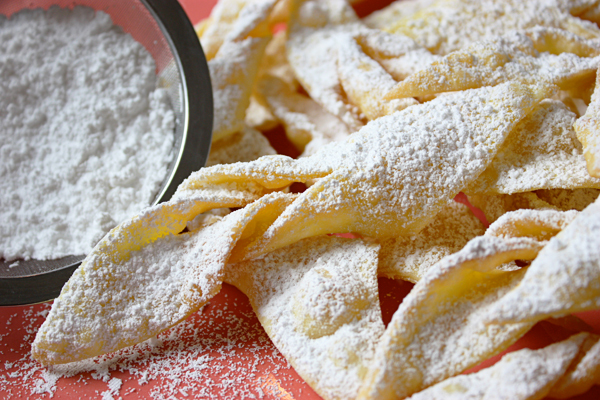 We would layer them between paper towns with the powdered sugar. They are so delicious. Thank you for sharing this recipe. I will be baking them this weekend. My Mom made these about 3 times a year! We are of Hungarian origin. We call them csoroge. They were so melt in your mouth tasty. These were a favorite of my older sister. I will make some for sure. Thank you for the good lesson! The end brought me to tears, reliving precious memories of Grammy making these, and so succulent to enjoy. They were so wonderful. Truly Angel Wings. Thanks for sharing. Thank you for the most wonderful instructional video! I have not made these in 50 years and they turned out perfect! I can see how you can say don’t eat them all in one sitting!! I remember making these in grade school with dark shadows and Barnabas Collins on the TV in the background! God bless you! Our neighbor used to make these every year at Christmas when I was little. She was Italian. She would dip them in honey and then sprinkle with the powdered sugar. I’ve looked for the recipe everywhere and just happened to come across this one by accident. Thanks for the idea about the cinnamon and nuts. I’ll bet that is good too! Thank you Jenny, I made these for Christmas, and I just made a double batch for Easter. I have also made your perogies recipe and the directions were wonderful and they came out great. I make them often. Thanks you and God Bless You! How do I get a copy of your cookbook? So excited to make these. My Polish grandmother was the greatest cook and baker and I loved her dearly. She made these on special events and they were sooooo good! I’m making them for Easter. I follow my Busia recipe and she always added a jigger of Brandy! Loved the taste! Omitted sour cream!! I just made them today! Babci was watching down from above – smiling I hope that her granddaughter in law who is Italian did this right! Her recipe calls for 2 tablespoons of Whiskey & sour cream. Love your style. You make it fun to watch and try. Overall, the story you shared was a great reminder of when I made cooking fun time with my mom. She would have loved to make these with me. Thanks for the memory. My sisters and I made in for years. It’s was tradition. Last time, I made them was Christmas 2014 for my sister. She had cancer, she wanted them real bad. She died Jan 18, 2015. I will never forget the smile and joy on het face. She said thanks and nobody gets any. Lolol. I’m of Scandinavian descent, and we would have “fatiggman” every year at Christmas. The difference between your Polish recipe and our Norwegian recipe was basically the flavouring used. We always used the whole cardamom seed and crushed the seed. That was the only flavouring. We always deep fried in lard. We bought the lard in large metal tins with removable lids, and these metal tins were what we stored the fatiggman in, after cleaning and washing them out of course. We never did use powdered sugar, but others did. Can the batter be made ahead of time and placed in the freezer? If so, how long can I keep the prepared chrusciki dough in the freezer? Hi Jenny. Just finished making these fantastic cookies and they came out excellent! I followed your video like you said and they came out perfect. My partner’s mother used to make these for us for Christmas and Easter time and they were always so delicious. She has since passed away, so been buying them from a Polish bakery near where we live. Now with your great recipe, I can make them myself. The orange and lemon zest really kicked it up a notch. I will be trying your recipe for cabbage rolls very soon! Thanks again, and have a great New Year. You have to fry these in lard. Not oil or crisco. Lard only. Dianna why does it have to be lard. My daughter just made them using canola and they turned out great. I am Polish and I know the pie crusts were always made with lard, did not think it was necessary to use that today. II have never even looked for lard. Is it by the shortening or is it refrigerated. I bake professionally, and lard is NOT required. A quality vegetable shortening, canola, or safflower work perfectly. Lard is refrigerated. That’s where you should find it. Lard can be found at Walmart by the Crisco and baking items. Lard can be found on the shelf in your supermarkets by the Crisco and sometimes in the meat department. I still use it for pie crusts. I used canola oil and they came out excellent! I’m sure lard works just as well, either way there are great cookie! Yes! It MUST be larder the authentic Polish experience! Loved making these with my grandma. We would use brown paper bags instead of paper towels to absorb the oil. And spread them all along the tables. My Grandma made these every Christmas, after she passed years ago we never had them again. (so missed these great cookies) I am trying for the 1st time to make them and bring back a family tradition. I am doing the tradition a little different. I am making 1 batch of cookies from each family heritage. I think this will make every one feel honored of who they are and where they originated from. I must get in the kitchen I have 8 kinds of cookies to make. Thanks for this recipe and wish me luck. They probably won’t come out as good as grandma’s. my nana passed away this year, she made these every Christmas, I have her recipe, I made it last year and came close. I will try it again myself tomorrow to make to honor her tradition. Merry Christmas to you. I made your cookies today. The recipe was easy and the video was helpful. The last time I made those cookies, I was 11 years old. I am 63 your years old. When I ate one of the cookies it took me back as a little girl. My husband loves the cookies. Thank you. I made these today. How should I store them? Tins, plates with Saran, etc. Chrusciki should be stored in an air tight container (or a tin) but do not use saran wrap. If you don’t have a big enough container, you can store them in a large pan tightly covered with foil. I am going to make these this week. The “old ” recipes call for VO – whiskey , did you ever make them with whiskey ? I use a shot or two of white rum. And be sure to fry them in lard. My recipe also includes alcohol….I can’t remember if it was vodka or rum. My first test run was successful. Chrusciki is a MUST for family celebrations and holidays! Yes you MUST deep fry these in LARD. Also a shot and half of vodka and a tbsp of white vinegar helps to repel the LARD after they are cooked. I use 7 eggs yolks and only enough flour to make a soft dough. Otherwise follow the recipe given above. my Busia, always made these for the holidays. and always used a jigger if whiskey. My Babci (grandmother) always included a shot of whiskey in her recipe. Thank you for posting this recipe. I have my grandmother’s but, unfortunately, it is incomplete. Even though we only made the seat Christmas time growing up I plan to make some tomorrow since I am so happy to have a complete recipe that so closely matches our family recipe. I,’ll make the dough and it will keep up to 3days in the frig. I attempted to make bow tie cookies for the first time last year for my elderly Grandma. Oh how I wish I had seen your video on how to make them back then! Your recipe seems much easier & more delicious! Thanks for sharing the recipe & including the “how to” video. After watching you make the cookies, I feel much more confident about making bow ties this year. Making these now!! Love your videos and spanking the dough. We laugh every time. Jenny, thank you for this recipe and video. My husband has a friend who is polish and for a long time I have wanted to make these at Christmas for her, but didn’t understand how to do the loop thing. Thanks to the video, I think I will try now. My question is, could I use my electric skillet to fry them? since it has a temp. knob? I don’t have a deep fry thermometer..which I will buy if needed, but just wondering. Thanks again. I think you can as long as the temperature dial is accurate. You may have to fry one at a time at first to test the temperature and adjust. My Busia always used her electric fry pan. Jenny – thank you so much for the foolproof recipe and video. My daughter is the one who found it as she was looking for a Chrusciki recipe to make for history class to showcase her Polish heritage. I watched the video with her all the while wondering who this chef was that looked so familiar. It wasn’t until a day or so later I finally realized who the chef in braids was. Your recipe was so easy to make and so delicious. I am not good with rolling dough but it was a breeze since we had seen you do it. I felt like my Bushia was right in the kitchen with us the whole time. The only problem is trying to keep our family from eating my daughters school project. Looking forward to trying some more of your recipes. Happy Holidays!!!! Bless you! My Mom made these from a recipe from her Norwegian Mother when I was young. She made them 2 weeks before Christmas. We had big potato chip tins we layered them in with wax paper to let them “ripen.” Powdered sugar went on just before serving Christmas Eve and New Years Eve. The flavor difference between, just made and “ripened” is remarkable! How long can you ripen the “wings”? Thanks! We used to make these with our Omi – i always assumed they were an Austrian recipe, but I guess they are made all over Europe! Am making some medieval German food and found a 16th century recipe for something very similar. Fantastiche! I always did this things when I did merengue cookies as I had 4 yolks to work with. I was very young when I tried this first time. I remember I did shape the dough in a long tubular form ( with a 2 -3 cm diameter). I cut slices (2 cm thick). Each slice was flattened in an oval shape, cut two lines inside the oval shape. I twisted the cookies in the same way. I am amazed of how small the world is. But as I quit making merengue cookies I also dropped these wonderful cookies.they were called “Sweet little lies” as they really melt in your mouth, not like a real cookie. Awesome recipe.The directions was easy to follow. Made it for a youth group and it was a hit!!!! My Croatian aunt used to make krostule and I never got enough of them. Now I can make them myself thanks to your video! I made some yesterday and they turned out great! I will make some for our family reunion. Thanks for the storage tips. Do you have a gluten free recipes for the Angel Wings? I have no experience with gluten free. To be completely honest I’ve never made this dish. But im a pastry chef and I’ve learned coconut flour is a great substitute for most pastries. Be very careful though it tends to make a dryer pastry. I would add an extra egg yolk so it hold better. Hope this helps you. i will try to do these cookies for my CNY (chinese new year) celebrations when relatives come to visit. And these cookies would be very special, something new. Thanks alot for sharing. I’m Polish on my dad’s side and have made these since a teenager. I’m 69 now, so have made quite a few. Our recipe is a little different -we use 6 egg yolks, half a can of evaporated milk, a little sugar, vanilla and a lot of “elbow grease”. We always made a large amount. After the dough is rolled and cut , I layer between sheets of plastic wrap to prevent the dough from drying. Always deep fry in small batches. We have help waiting to roll in powder sugar after they drain. I always layered them with waxed paper in an old fashioned picnic basket so they didn’t “sweat”. We always had 3-4 people to move things along. We made these normally at Christmas and would make between 200 -300. A lot of work and fun. From start to finish, including clean-up,about5-6 hours. You can always vary your ingredients based on how many you want and how strong your back is. LOL Most of the time, I had to hide the basket! Just made these. They turned out awesome. I made quite a few. Any suggestions on how to store them to keep fresh till Sunday? If I’m making these a day or two ahead. Should I wait to put the powdered sugar on? Reheat day of party and then put powdered sugar on? You may have to research this to be sure but I think I would add the powdered sugar when they are made and if they need more when serving, you can always add a little more. called Scandinavian Twists. They are made much the same way [the cutting, frying& powered sugar]. The big difference was no sour cream or zests. Cardamom is the flavoring used. Small world!! My husband loves them. How much cardemom is used for a recipe this size? I’d like to double this recipe, and would like to know if a stand mixer would be OK to use and would the dough come out the same ? A friend from Poland came to my home to make these. She mixed the ingredients right on the granite table. “No bowl”, she said. She fried them in a small sauce pan, few at a time with a piece of potato in the water to avoid burning. She also used a shot of booze into the mix. My Polish father always made these as a special treat for us. Similar ingredients, but used the ‘cream’ from about 3 pints of bottle milk-full cream with the cream on top-good old days! Always used a little rum or brandy to help them be brittle.Brilliant website showing so clearly how to make the ‘angel wings’. Thank you. My dad was born in warsaw Poland and he made these all the time , i also now make them myself but dad used to put alchohol in them im sure…. Does anyone else use alcohol and if so which one please ? Hello, I am Lithuanian and we always make these “cookies” at any time of the year. They are awesome! And , yes, we always add a little bit of alcohol (vodka, to be specific) into the mixture/batter. Alcohol suppose to protect “zagareliai” (Lithuanian name for it) from absorbing too much of oil while frying. I think the alcohol is only for flavour. There’s no liquor left once you fry the cookies. I’m not sure but I think the dough would still be too small for a stand mixer to do the job. With baking, the less you change things the better so I would stick with the hand mixer. I made then yesterday.Unfortunately … Nothing left for today:). Thank you for the recipe.I’m Polish. They are very popular in Poland during carnival. In the part Poland wher I grew up we called them “faworki”. They turned out perfect. And this was actually the first time I made them by myself. I remember that my mother added instead of lemon or orange zest a little bit of spirytus ( which is a type of grain alcohol) or a little bit of vinegar. This made them puffing up even more during frying. Also we used a special cutter to cut the dough. It’ s called ” radelko”. It’s like a pizza cutter but has sort of dents on the cutting side.Radelko makes your faworki quite fancy with ornamental edges. I have never seen” radelko” in USA but my husband brought one from Poland years ago so had the chance to use it yesterday :). Very good memories…Thanks again for the recipe. Hi Magdalena. Is this radelko like a fluted pastry wheel? OMG, I used to make these with my mother when I was a little boy. The BEST cookies I have ever had. So MUCH Fun to eat. Thank You for sharing… Great Memories & can’t wait to make with my family. These were DELICIOUS!!! The video was very helpful. I will definitely be making these again. Thank you!! Thanks for the recipe. This is by far the BEST one!! You have helped me immeasurably! I had been making these for years and worked very hard on them — my dough, however, was always very stiff and difficult to roll out. I watched your video and observed the consistency of your dough as it was beaten, kneaded and rolled out. What a difference it has made! My preparation time has been cut in half. Thank you! Hi Jenny! I am thrilled that I found your webpage and strictly by chance! I was a great fan of your talk show and still really miss it. Anyway, my 92 yr. old mother and I just made 100 pierogi for the holidays and will be making Chrusciki on Monday. Just wanted to give you a quick tip: I use my hand-cranking pasta maker by starting off thicker and then turning it down to get my dough to the thinness I want. Takes a lot less effort than all that rolling and it’s quicker too. Wesolych Swiat! Thank you for sharing this. And Wesolych Swiat back to you. I really want to make these, but after reading all the reviews, I’m exhausted already & a little panicked just thinking about it! I think I will enlist the help of my local bakery & just chill this year! Maybe next year I’ll find the patience…God bless all you fine women, though! Help! Pomoc! Please! I desperately need a gluten-free recipe for these! My Polish aunt made these and cooked them in Lard. Lard being more natural. They were delicious. Thank you for this recipe. It is very similar to the recipe that my mother and grandmother used. Unfortunately, my puppy ate the recipe card and I was having trouble remembering all of the ingredients. We also add a shotglass of southern comfort — it adds to the lightness. Merry Christmas! My mother used to make something similar to this and she called it fattigman (poor mans cookies). Our family has huge issues with lactose intolerance and sour cream is a big no-no. In most recipes we replace it with plain Greek Yogurt. Would that work for this recipe? I have only made them with sour cream so I’m sorry I don’t know how yogurt would work. What about a dairy-free sour cream? Wow, I have never seen this. I’ll have to check at Whole Foods and see if they carry it. If I try the Greek Yogurt I’ll let you know how they came out. I’m curious. How is Greek yogurt not dairy? My grandma used to make these all the time for all her grandkids. She put rum in hers not sure how much though and used to store them in a popcorn tin. Yes she made that many at one time. I wish I new her recipe with the rum I would love to share with everyone. I’m going to try these and hope they are as good. Thank you for the video. Very helpful and I love your colorful kitchen utensils. My Mom made these each Christmas called them Fawdamañ cookies or Dani’s Sheep’s ears. Thank you for reminding about thee and how special thy are. You really have to make the dough as thin as possible, otherwise when fried they come out, well not very crispy. I have never been able to get them thin enough without either tearing the dough or having it “roll up” and around the rolling pin. My mother used to tell me that her grandmother and mother would say you knew it was thin enough if you could read a newspaper under the dough. That’s pretty thin! I found that using my pasta machine let’s me roll it really thin plus I can work in smaller batches so the dough doesn’t dry out. You can not freeze chrusciki once they are fried but some people say they freeze them after they are rolled but you will need to search a little online for exactly how that’s done. I don’t feel comfortable advising on something I have never done. Can I make the dough a day ahead. And than bring the dough to room temperature before rolling them out? I have never made the dough in advance and tried to research if anyone has made it in advance and could not find anything. I’m sorry I don’t have a better answer. If anyone has made their chrusciki dough in advance, please let us know. My grandmother made a similar recipie calling for a shot of Seagrams 7 to sour some cream, the shot size was “the one with the handle”. 😍 I do have the shot glass. My grandmother’s recipe calls for letting the dough sit in the fridge overnight. Have only done it this way and comes out great. A little tip I discovered regarding making these. The dough from this recipe ( no sour cream but there is brandy!) is very “elastic” and difficult to roll out very thin. I found that if I use my Kitchenaid pasta roller I am able to make them very thin and once frid they just melt in your mouth! I hope this tip will save someone’s arms and shoulders as it has mine! I freeze mine all the time and pull out small amounts as desired. I put them gently into a freezer bag and then place in a big bowl so they don’t break. They keep well in deep freeze for a long time. When they defrost, they are still crispy and actually taste even better. I am Ukrainian and make these all the time. Hope that helps. This recipe sounds much like one my grandma used to make. She called them watermelon crackers as she made them in the summer. No powdered sugar though, just a very light sprinkle of salt. I used to help her turn the ends around through the slit in the dough. Oh the memories. of these components to knead a smooth dough, it takes about 10-15 minutes. No. They can only be fried. My bushia stored them in a paper bag from the grocery store with the top of the bag rolled tight. Hi, I just won a lovely basket of these delicious cookies (aka “angel wings cookies”) today, and wanted to know how to keep them fresh until this Easter Sunday? Can they be frozen or will they stay fresh from now (Wednesday) until this coming Sunday in an air tight container or plastic wrap? Thanks! Do not use an air tight container or plastic wrap. They need a little air. Please see some of the comments below that address this and also in the recipe above I address how to re-crisp them. Good luck! You are absolutely right. No plastic and no air-tight container. In years past, we did them 2or3 days ahead and put them on a tray on top of the refrigerator with a cotton dish towel placed lightly over them. Large tin box … got ya! Thank you for the advice. Much appreciated! No, they have to be fried. Thank you so much for posting this along with a video. My wonderful Polish neighbor lady would bring these to share with my family every Christmas season. Sadly she passed away this year. I made a batch today. Still not exactly like hers, but they are delicious! I am going to continue making them myself to carry on the tradition in remembrance of her. I’m so glad I came across this recipe. I think it’s very similar to the one my grandmother made every Christmas for us. She had a Norwegian name for them, but called them bowtie cookies. I believe hers had a spoon of brandy instead of vanilla. Can’t wait to test these out! Thank you Jenny! Made these this morning and they turned out wonderful! Brings back wonderful memories of my Polish heritage at Christmas and my sweet grandmother. This batch is going to my mother who has been begging for some. She will be very surprised! Merry Christmas!! This looks delicious, Polish recipes is a very interesting one, I will surely try this cooking in Christmas time. Enjoy your Christmas Jenny! Thank you. Thank you Jenny, great recipe I have not had these for years. I am going to suprise my siblings this christmas with a blast from the past. We all loved these growing up. I fine-tuned this recipe and found that a slightly lower oil temperature is better, keeping the chrusciki from browning too much. I changed the temperature from 375 to 350-365° F.
I also reduced the frying time to about 30 seconds. I’m getting ready to make a how-to video next week!! They will keep for almost a week but they are always better in the first 2 or 3 days. I usually pile them in a container and cover it loosely with a top or I make a foil tent. If they are tightly sealed with no air at all they can lose their crispness. I seem to remember that a Polish lady told me years ago that she froze them. Have you had any experience with doing this? Yes, you can definitely freeze them. They freeze exceedingly well for up to several weeks. Of course, this is no guarantee that they will last longer as they taste delicious frozen, too, as my older brother discovered. Just made these cookies and they are delicious . My husband helped me cook them and we ate the first layer. Will be making them again! Like your recipes and the videos! Been looking for this recipe for years typed, “Polish christmas cookies powdered sugar” into google and got here. Thank you so much. The urchins don’t believe that we used to get oranges and apples in our stockings – out of season fruit was a HUGE deal when I was a child. These cookies were pure extravagance. Thank you. Jenny- my aunt and grandma used to make these when we lived in Chicago! I loved them as a little girl and now I can’t wait to make them for my kids! I am even making a batch for my church’s women’s bible study Christmas Tea! Thanks for reminding me of my Polish grandma and my childhood! Jenny, I have enjoyed your videos and recipes so much. I am Polish and appreciate your sense of humor. Hello Jenny, I got your cookbook on line and I couldn’t be happier right now. My mother made these every holiday and she has been gone from me for 36 years. I have been trying to get the recipe for this for many many years, since her passing. I have asked people everywhere, even at the polish store that I shop at, and no one new what I was talking about. Thanks so much for shareing this recipe. Maybe now my holidays will feel like they use too. And my family will have this tradition now. Keep up these Polish recipes Jenny. Oh Jenny, could you do a video on this please? Seems complicated. Love your videos and your sense of humor! thanks for recipe. gonna surprise my hubby for his polish side. i used to watch your tv talk show. My grandmother used lard to fry them in!